Nuala Woulfe Beauty: Introducing SkinCeutical Lip Repair Complex. 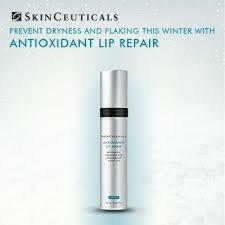 Introducing SkinCeutical Lip Repair Complex. The lips form a part of the central triangle of the face. They very often react to the changes of the seasons quicker than any other skin on your face. The lip anatomy presents specific challenges when it comes to care. Repeated application of a hydrating antioxidant helps to prevent premature lip tissue wrinkling, maintain the structure of the lip and smooth the surface. Our lips have more than a million nerve endings but do not have a defensive membrane for protection so require constant hydration and moisture. Lips have no sebaceous glands, this leads to a constant need for moisture. Saliva is the only source of moisture but leads to chapping and dryness, magnifying signs of ageing. There is no melanin present in lip skin so there is no protection from UV exposure. Lips can develop sun spots and skin cancer regardless of Fitzpatrick type. Environmental ageing can cause the vermilion borders of the lips to lose their youthful outline, sometimes forming deep vertical lines above the lip. Lips have a thinner stratum corneum to that on the face, which needs reinforcement. Lip skin typically has three to five cellular layers, facial skin has approximately 16 cellular layers. For this reason, the visible blood capillaries give the lips their red-pink pigment. We are delighted to introduce SkinCeutical’s new AOX Lip Complex, a restorative antioxidant, plumping lip treatment specially designed for damaged or ageing lips. Two powerful antioxidants, vitamin E and silymarin, form a combination therapy for the lips. This restorative treatment helps prevent environmental damage, while smoothing and rehydrating the lip surface. A complex of humectants and emollients made up of hyaluronic acid, hydroxyethyl urea and glycerine help attract and retain water to rejuvenate, reshape and replenish lip tissue. Special botanical emollients hydrate and heal dry, dehydrated lips, to smooth deep lip lines for full, healthy, youthful lips. AOX Lip Complex offers a versatile treatment, able to be incorporated as part of a daily care routine, or as an intensive overnight treatment. In addition, the lip concentrate offers significant benefits when offered as part of pre and post-procedure care , in order to prime the lips ahead of treatment by restoring lip tissue and for relieving common after-effects such as dryness, tightness and swelling. The AOX Lip Complex treatment can offer relief for clients suffering from lip dryness due to drying prescription therapies such as oral isotretinoins. The botanical emollients in this special treatment formulation help to hydrate and heal dehydrated lips and smooth deep lines leaving patients with full, healthy and youthful-looking lips.